Years ago, my mother-in-law, Bonnie, now deceased, gave me an 8-inch caste-iron skillet. It now hangs along side other 8-inch skillets purchased after I started cooking for one. The skillet retains it quality just as my mind holds on to my memories of the woman who gave it to me. Bonnie was a wonderful woman and a saint of a mother-in-law. My mother lived twelve hundred miles a way in California, so Bonnie became my advisor, confidant and friend. So much so that when my new husband and I encountered the rough patches found in many new marriages, I would pack up the car, including my then two-year-old step-daughter, and head out to visit Bonnie who lived 25 miles away in the small town of Culver, Kansas. Bonnie never asked why the visit although she sensed my troubled emotions. She just welcomed me, soothing my hurt feelings and making me feel every thing would turn out fine. She never took sides and I never asked her too. She simply led me to the understanding that tomorrow would be another day and everything would be okay. By late afternoon, when I returned home, any problems seemed resolved and gone. Bonnie and I made a number of trips together. She enjoyed everything she encountered. She missed nothing and delighted in life like a small child. I loved her dearly and think of her every time I use that kitchen treasure she gave me so long ago. Cast iron takes longer to heat than other skillets, but once hot, contains more thermal energy than other skillets, giving it great searing power. And, properly seasoned, cast iron is naturally non-stick. I season mine after every use, first cleaning with boiling water, rubbing with vegetable oil (unsaturated fat works best) and then heating in a 375°F oven so the oil breaks down to form the non-stick surface. Caste iron is great for baking cornbread, frying chicken or any other food on which you want to obtain a good crust — like this pork chop recipe based on one found in the Jan./Feb. 2012 issue of Saveur. 1. Dissolve ¼ cup sugar in small heavy-bottomed saucepan over medium-high heat, swirling pan often. Once sugar becomes liquid caramel, remove from heat and add boiling water. Return pan to heat and continue to cook, swirling pan until caramel dissolves. Cool. 2. Pour cooled caramel into a small food processor along with oil, shallots, soy sauce, oyster sauce, pepper and garlic. Process until smooth. 3. Place pork chop in small plastic bag or dish along with marinade. Marinade in refrigerator for at least one hour or up to 12 hours. 4. When ready to prepare, heat caste-iron skillet over medium high heat. 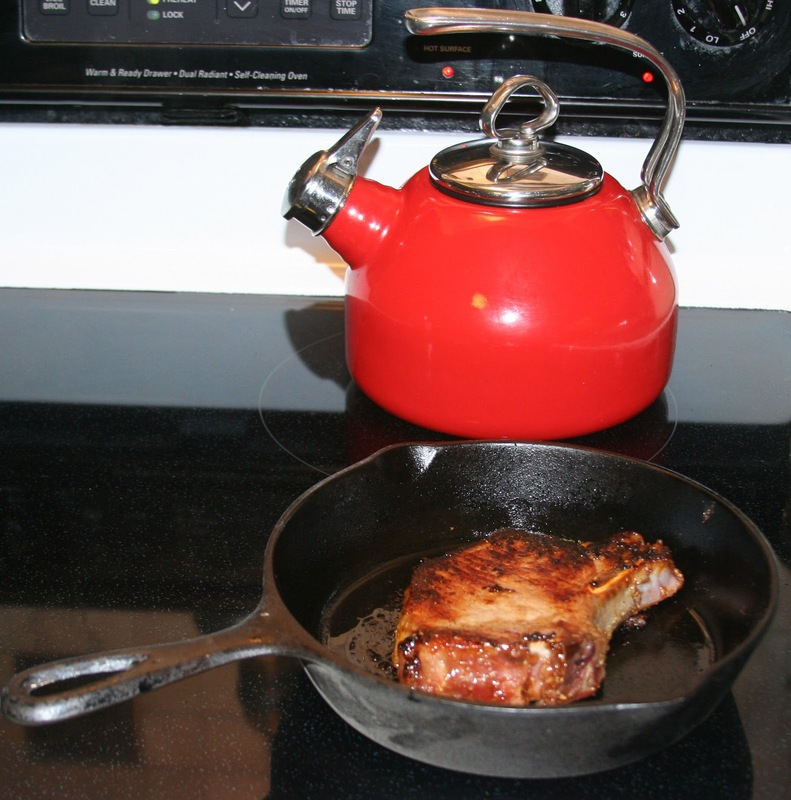 Once the skillet is hot, place the drained pork chop in the skillet. Sear 7-10 minutes per side, making sure internal temperature reaches 165°F. Remove pork chop from skillet and rest 5 minutes. Serve with rice. If you wish, you can heat the marinade to serve over the rice. Note: If you do not have a caste-iron skillet, you can use a non-stick skillet. I have a cast iron skillet that I treasure as well. It was my maternal grandma's and has a manufacturing date on it of 1910! In the old days, when I could afford to have someone help me clean my house, I discovered her in the kitchen attacking the skillet with a Brillo pad and Ajax. She was trying to get all that black off! Great sounding recipe! Thanks again, Jean.